Archie Reece Dykes served as the third executive of the University of Tennessee at Martin between 1967 and 1971. Dr. Dykes was born on January 20, 1931 to Claude Reed Dykes and Rose Quillen in Rogersville, Tennessee. He received Bachelor of Science and Master of Science degrees in education from East Tennessee State University in 1952 and 1956. He receive his doctorate in education from the University of Tennessee at Knoxville in 1959. Dr. Dykes' career in education began in 1955 as principal of the Church Hill High School in Marshall County. In 1959, he was hired as the Superintendent of the Greenville City Schools. Three years later he moved to higher education with an appointment as director of the University of Tennessee Center for Advanced Graduate Studies in Education. In 1967, Dr. Dykes accepted the chancellorship of the University of Tennessee at Martin, replacing the retiring Paul Meek. He remained only three years before returning to Knoxville in 1971. 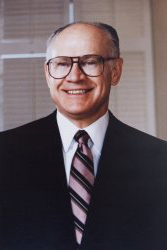 In 1973, Dr. Dykes became Chancellor of the University of Kansas. He held that position until 1980 until becoming Chief Executive Officer of the Security Benefit Group of Topeka. Since 1988 Dr. Dykes has been Chairman of Capital City Holdings Incorporated.